Dedicated Freight Corridor Corporation of India (DFCCIL) conducted a written examination for the post of assistant manager, executive, Jr.Executive and Multi-Tasking Staff in various disciplines. A Candidate can apply for more than one post. However at the time of the filling of the application, the candidate must ensure that he is applying for single post in Cluster “A” and single post in Cluster “B”, since the examination for all the posts in Cluster “A” and for all the posts in Cluster “B” posts may be organized at the same day. The candidate cannot apply for 2 or more posts within the same cluster (Cadre) i.e. 2 posts in Assistant Manager Cadre or 2 posts in Executive Cadre. Simultaneously, the candidate submitting more than one application for the same post will be summarily rejected. No there is no interview after written examination. Notify this to DFCCIL, they will better help you in this matter. Yes you have chances of selection. It is good score really. I want to see your no. from where you are getting the marks secured in the exam? Sir I get 52 marks in executive civil ..obc category.what do you say. You have less chances of selection. But never lose hope. Jr executive electrical 66.00 marks. Obc category. Is their any chance sir. Yes, You have chances of selection. I secured marks 63 in dfccil 2016 exam for electrical executive post.What are my chances of getting a call from the company.I belong to OBC. My branch is Electronics and communication. I secured 64 mark in DFCCIL 2016 exam. What are my chances of getting a call from the company. I belong to the general category. You have very less chances of selection. But never lose hope. Sir my score is 79 and I belong to obc . what is my chance?? 79 marks are good marks. You have good chances of selection. is their separate cut off for gk and reasoning section? No. 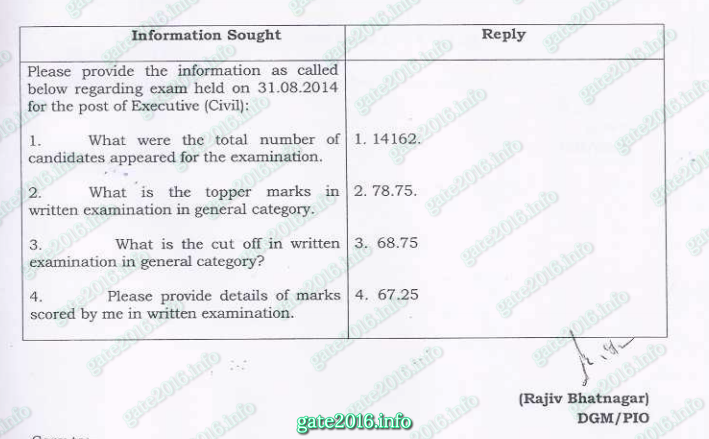 There is no any separate cut-off for gk and reasoning section. What will be expected cut off of executive operating ? this is one of the best site i have ever seen for PSUs. Thanks for appreciating our work. DFCCIL paper pattern : There will be 100 multiple choice objective type questions with one correct answer. Out of the 100 questions, 80 questions shall be related to subject/discipline/post applied by the candidate, 10 questions shall be from General Knowledge and 10 questions on Reasoning. 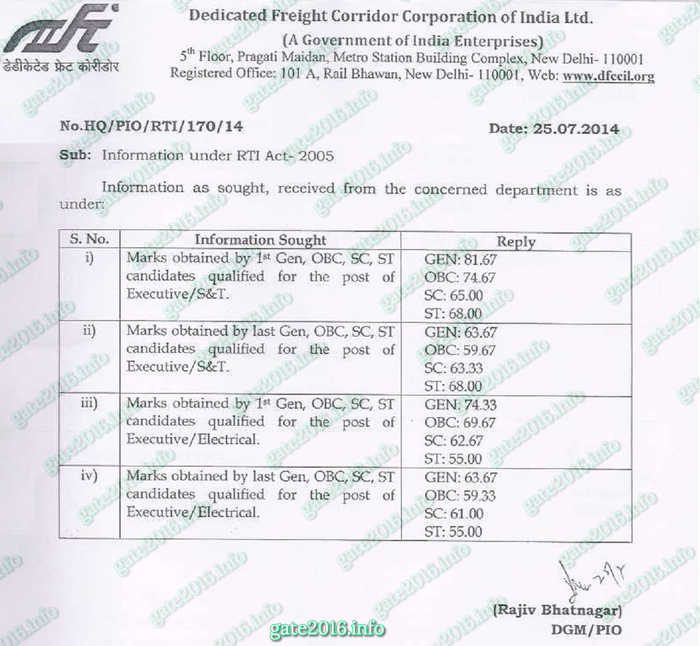 DFCCIL Executive electrical exam is almost same as DMRC JE electrical exam. So you can refer DMRC JE electrical syllabus and reference books. Remember DFCCIL never provide syllabus for their examinations. DFCCIL neither provide any syllabus nor any exam paper for any post. So it is really hard to provide exact syllabus of DFCCIL SC post. i am ashwini kumar(Electrical Engineering) and applied the post for “Executive station controller and station master” in DFCCIL. please you guide me what the syllebus for this post. non-tech or technical. DMRC AND DFCCIL Exam pattern & Syllabus would be almost same for same post. sir please provide syllabus and pattern of exam, and how to prepare for this exam..